GoodReads Summary: The Shadow Fold, a swathe of impenetrable darkness, crawling with monsters that feast on human flesh, is slowly destroying the once-great nation of Ravka. Alina, a pale, lonely orphan, discovers a unique power that thrusts her into the lavish world of the kingdom’s magical elite—the Grisha. Could she be the key to unravelling the dark fabric of the Shadow Fold and setting Ravka free? The Darkling, a creature of seductive charm and terrifying power, leader of the Grisha. If Alina is to fulfill her destiny, she must discover how to unlock her gift and face up to her dangerous attraction to him. But what of Mal, Alina’s childhood best friend? As Alina contemplates her dazzling new future, why can’t she ever quite forget him? I’ve been meaning to read this for some time now. I’d heard from all sorts of blogs that is was great, well written, creative, and engaging. Well, I would agree with all of those things. I really enjoyed this book. Once I got into it, I couldn’t put it down. 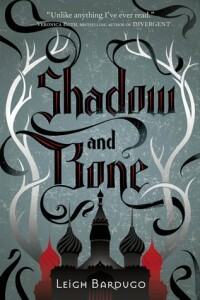 Bardugo very nicely created a world that is concrete and believable. The idea of the Shadow Fold was chilling. The first crossing was nightmarish. Alina should definitely not have survived. Except she did. Because she can harness the power of the sun. Or so the alluring and dangerous Darkling tells her. The Darkling. Is it wrong that I was rooting for him the whole time? I usually don’t do that. I don’t choose the creepy guy. But oh boy did I want Alina to fall for him. I think it had to do with the fact that he allowed himself to be vulnerable around her; he showed a side of himself to her that he didn’t and couldn’t show to anyone else. Or at least, that’s what I tell myself, now that the book is over. Unfortunately, I believe that ship has sailed. Too bad. He was great. Or so I tell myself. Alina was a little annoying. I get tired of the whole, “I’M SO ORDINARY. IT CAN’T BE ME” even though whatever their special thing is has been proven more than once. Yes. You can summon the sun. Get over it. Eventually she embraced her power and became less annoying. I think I’ll like her a lot more in the second book. Mal. Wow. You just kind of jumped out of nowhere. I thought you were going to be the annoying love interest that nobody wants around but authors push for. You were the best friend who doesn’t give Alina a second a look. I wrote you off after the first chapter. And then, when I realized a love triangle was in the works, I started to get nervous. But honestly? I really liked how Bardugo handled the love triangle. Those are surprising words coming from my mouth. Or in this case, fingers. It was different and refreshing, although painful. But it was painful in a good way, a way that showed you cared about all the characters involved, rather than just painful for the reader’s sensibilities. I read some reviews that lashed against some of the incorrect uses of Russian language/culture etc; I know next to nothing about anything Russian, so none of that bothered me. There seemed to be a wide rift regarding this book. Groups of people really don’t like it, which is so bizarre to me, because I loved it. I thought the story was handled well and the world was built successfully.